When the generatrices are planes: . Cartesian equation (special case): . It is therefore the resulting surface of the translation of a curve (first generatrix) along another one (second generatrix); this definition is symmetric in the sense that the translation of the second generatrix along the first one results in the same surface. 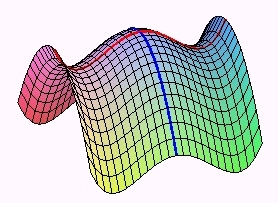 For example, the surface is obtained as the translation of the red curve along the blue parabola or the opposite. A translation surface is therefore a special case of Darboux surface. If we define the Minkowski sum of two subsets and of the space as the set of points M such that where describes and describes , then a translation surface can be defined as the Minkowski sum of two curves. We get an equivalent definition by considering the surfaces geometric loci of the middles of the segment lines the ends of which describe two curves ("midsurface"). - the hyperbolic and elliptic paraboloids (the two generatrices are parabolas), only translation quadrics. and the surfaces z = f(x) g(y)?